One Book, One Jewish Community is the largest community-wide Jewish literacy program in the country. Each year, the Implementation Team carefully selects a book to share across the Greater Philadelphia community. The year-long programming connected to the annual book selection gives thousands of individuals varied opportunities to learn about new Jewish authors; explore Jewish culture; and share the joy of reading with others in our community. There are many variables that go into the choice of the One Book, One Jewish Community selection. The Implementation Team looks for a book that is enjoyable and accessible and offers an insight into one or more Jewish values or concepts or a particular Jewish cultural world. To that end, we have, in the past, read books about the Jews of Iraqi Kurdistan (My Father’s Paradise); Israel (The Wanting); Yemen (Henna House) and the Soviet Union (A Backpack, A Bear, and Eight Crates of Vodka). To learn about Jews of other times in history we have read about the Spanish Inquisition (By Fire, By Water); Jews in the American Civil War (All Other Nights) and the Holocaust (The List). We immersed ourselves in the cuisine of Israel with last Zahav: A World of Israeli Cooking and then, last year, we explored the complicated ethical questions surrounding the questionable values of a musician relative to our ability to enjoy the music in And After the Fire. This community event is open to the public and includes a presentation and book signing with the author. Books will be available for purchase both before and after the presentation. The Last Watchman of Old Cairo is a fascinating, multi-generational novel about Joseph, a man who seeks to unravel a centuries-old family secret that ties him to both the Muslim men of his family and his American Jewish mother. Connecting with his family in Egypt, Joseph learns about the family “business” of serving as watchmen of the ancient Ibn Ezra Synagogue. The story includes the fascinating discovery of the Cairo Genizah, a treasure trove of medieval Jewish documents, including the “Ezra Scroll.” British sisters and scholars, Agnes and Margaret Smith, and rabbi and educator Solomon Schechter are the main characters in this chapter in history. 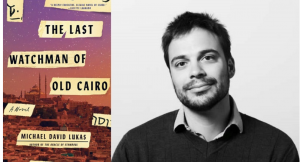 Lukas also is the author of the internationally best-selling novel, The Oracle of Stamboul, which was a finalist for the California Book Award and the Harold U. Ribalow Prize. It has been published in 15 languages. He is a graduate of Brown University and was a Fulbright Scholar in Turkey and a student at the American University of Cairo. His writing has appeared in The Wall Street Journal and The New York Times and he works at the Center for Middle Eastern Studies at UC Berkeley. For more information about the author, go to michaeldavidlukas.com. Are you interested in hosting a program? Do you have a suggestion for a program for the One Book, One Jewish Community committee? IF your organization/synagogue would like to host a program connected to the themes or events depicted in this book, please list it in our Calendar. Check this page frequently over the next year for information on these events as they are publicized. Also, LIKE us on Facebook, follow us on Twitter and watch for us on Instagram. We also invite you to learn about our past selections. To learn more, contact Alyse Unterberger, Director of Special Initiatives.